GAITHERSBURG, Md. – A corporate executive with electronic retail giant Best Buy says a United Airlines gate agent denied him a seat in the first class cabin because he was wearing a track suit. In an exclusive interview with FOX 5’s Will Thomas, Armando Alvarez recalled his experience Monday, October 26. 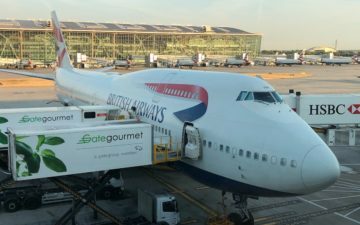 He said he used his miles to upgrade to first class on a flight from Dulles to Connecticut. Alvarez said the gate agent called his name and when he walked up to the counter for his upgrade, the agent said he was dressed too casually for first class. What an outrageous story. My understanding is that this was a United Express employee, so I can hardly say that I’m surprised. That being said, it still amazes me that he was singled out. When you watch the video interview he claims that he was wearing the same outfit when he got denied the first class seat. And sad as it might be, he’s probably one of the better dressed people in first class. He’s not even one of those people with dirty feet that wears flip flops…. While I wouldn’t wear a track suit when flying, I have no problem with it. I change into pajamas when I fly longhaul flights, which probably looks even sillier (yet is the norm). Then there are the parts of this story that make me chuckle. “If this happened to me and I’m a United Airlines Red Carpet Club member then I believe it’s happening to other people and this must stop,” Alvarez said. And of course the real issue is that he used miles to upgrade a sub-500 mile flight. I hope he meant 500 mile upgrades and not 15,000 miles! Oh, and I agree with Matthew that United really needs to crack down on the United Express gate agents at IAD. They’re just awful. Any chance he was confused as being non-rev? As a kid, I only flew non-rev (my dad worked for Western/Delta), and we had to dress up anytime we flew, and more so in first class. I could understand her reaction if he were a non-rev of somekind. SHE SHOULD BE FIRED if it wasn’t a misunderstanding. Unacceptable! I’m going to start wearing a track suit when I fly United. Just think of the vouchers that this treatment could generate! There’s gotta be more to this story. This guy can’t possibly have been the first track-suited (or otherwise “dressed down”) F passenger that this GA ran across. BTW, glancing over his complaint email in the video, this VP ought to take a writing class. @Gene: My thoughts exactly. I’ll be going through IAD Friday and Saturday this week! @ whakojacko — The hate is for people with dirty feet that wear flip flops. Have dirty feet? That’s fine. Wear flip flops? That’s fine. Just please not both. I am flying international F next week, and I will wear my jogging suits to see I get kicked out of F.
i agree with oliver, there’s got to be more to this story, i just can’t see something like this happening for no reason. We all know how annoying some passengers can be, especially a premier with a sense of entitlement. I would really like to hear the GA’s side of the story. another thing i don’t get, if he fly the some route every week shouldn’t he have almost 100 EQS and be on a first name basis with all the GAs by now? I guess that “track suit” could mean a clean garment with long pants, or a clean garment with tiny running shorts, or a garment unwashed since yesterday’s marathon. In my opinion, the gate agent would have been correct for the latter two possibilities. @399Retouch – he was wearing his “complete Puma outfit” (nice plug!) – the same one he was wearing during the interview. I did notice his shoes were not Puma though (minor technicality I know, when the rest of the story is highly credible). This incident bring to light the poor service many of us have received by UX at IAD and hopefully will result in a shakeup and improvements. United is out with its side of the story. Airline spokesman Robin Urbanski told me in an e-mail Thursday evening that the airline does not have a policy that would prevent a customer from sitting in first class for dressing too casually. Instead, the gate agent apparently thought the customer in a track suit was an airline employee. If that would have been the case, an employee would have been subject to a dress code.